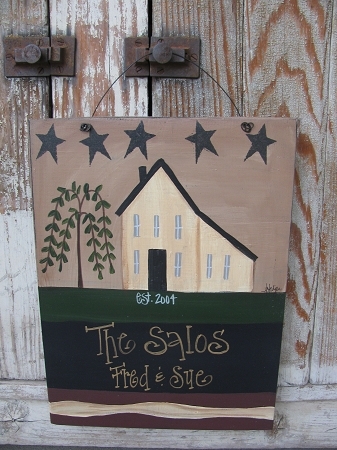 Primitive Patriotic Americana Personalized Saltbox House Sign with Stars. Personalized signs are popular and also make great gifts as well. This sign is great for the summer months, a military family or just to show your patriotic spirit year round! Made from a 1" pine board that has been sealed for protected outdoor use. Size is 10"x12". Personalize with your own greeting. If you'd like est. date that would go under the house. You don't have to. Some have chosen a general greeting, an military type saying and as much or as little of the family names as they wish. The choice is yours. If you have any questions though, don't hesitate to ask. Hand painted, designed and signed by Heidi.